N 6546 - Bi-Fold Door Bottom Pivot, Acme, Cox, Steel base, 2 per package. 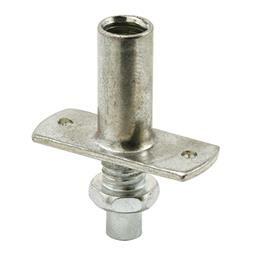 N 6547 - Bi-Fold Door Bottom Guide Wheel, Acme, Cox, Johnson, Steel base, 2 per package. N 6584 - Bi-Fold Door Bottom Pivot, Cox, Nylon base, 2 per package. N 6673 - Bi-Fold Door Bottom Pivot, Nylon base, 2 per package. N 6696 - Bi-Fold Door Bottom Pivot, Nylon base, 2 per package. N 6706 - Bi-Fold Door Bottom Pivot, Nylon base, 2 per package. N 6707 - Bi-Fold Door Bottom Pivot, Johnson Hardware, Nylon base, 2 per package.